Runners leave the starting line at the Spa Running Festival Summit Challenge Half Marathon. Sweeping, expansive views of the Mississippi River, along with a course that takes runners through Arsenal Island in the middle of the river, await at this late September race that also features a “micro-marathon” for kids. Take a downhill run through the mountains of southern Utah just outside Capitol Reef National Park and Grand Staircase Escalante National Monument at this race, which starts at $40. Run about an hour’s drive north of Indianapolis at this early October race, which runs along country roads and the Adams Mill Covered Bridge, one of a number of historic bridges across the state. Set for its 6th annual running along the Shore Road Promenade that looks out onto the waters of New York’s Upper Bay from Brooklyn’s Bay Ridge neighborhood, this race starts at $50. Run in the heart of the fall season and planned as a fundraiser for the locally based Forest Lake Area Trails System — hence the nickname, the “F*L*A*T*S” Half Marathon — this race takes runners through Thousand Hills State Park and starts at $40. Set for its 8th annual running along the single-track trails that wind through Pennsylvania’s Poe Valley State Park, which lies roughly a half-hour’s drive from Penn State University, this race starts at $40. Runners get the chance to trek through the wooded, tree-lined dirt and gravel trails of southern Minnesota’s Nerstrand Big Woods State Park at this race, whose fees range between $30 and $40. Run the fast (and very flat) crushed limestone and dirt trails that make up the Three Eagle Trail, built on an old railway line that stretched between the cities of Eagle River and Three Lakes, at this race, which starts at $40. Runners get to enjoy a fast, flat road race with beach and oceanfront views at this race, which welcomes both runners and walkers for this race along the Jersey boardwalk. Starts at $50. Most of this race takes runners over the crushed limestone trails of the Butler-Freeport Community Trail, and follows a long, steady downhill descent from the start in Cabot to the finish line in nearby Freeport. Nestled among the Adirondack Mountains of northernmost New York state, this small town is perhaps best known today for its abundant apple orchards, which runners will have the chance to run past on their way around the course. A Halloween-themed trail race that takes runners through the foothills of the Catskill Mountains, this race has something for everyone — challenging hills, deep woods forests, wet and inclement weather, and plentiful natural beauty. Timed to coincide with the city’s annual Downtown Florence Pecan Festival, this small-town race follows a route with numerous twists and turns through mostly flat neighborhood streets, running past two local city parks along the way. 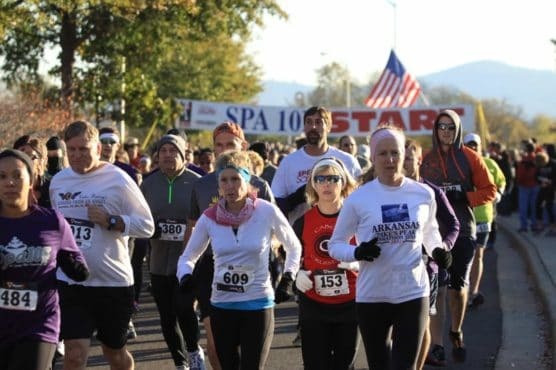 You’ll run nearly all the way to the top of West Mountain inside Arkansas’ Hot Springs National Park at this race, which unfolds past the park’s historic Bathhouse District and then through Whittington Park before heading onto the roads that climb up to the top. Set for its 10th annual running, the U.S. Ameribank Brandon Half Marathon & 5K sees more than 400 runners each year take to the streets of Brandon and nearby Tampa, and cross a finish line at a fast, flat course that’s considered “ideal” for setting personal record times. i used to live in NY , and as a citizen (65 years old +) the price of the race was same as the students , why in Florida, is to expensive ? Maybe i’m wrong, but really, give me a brake!! !